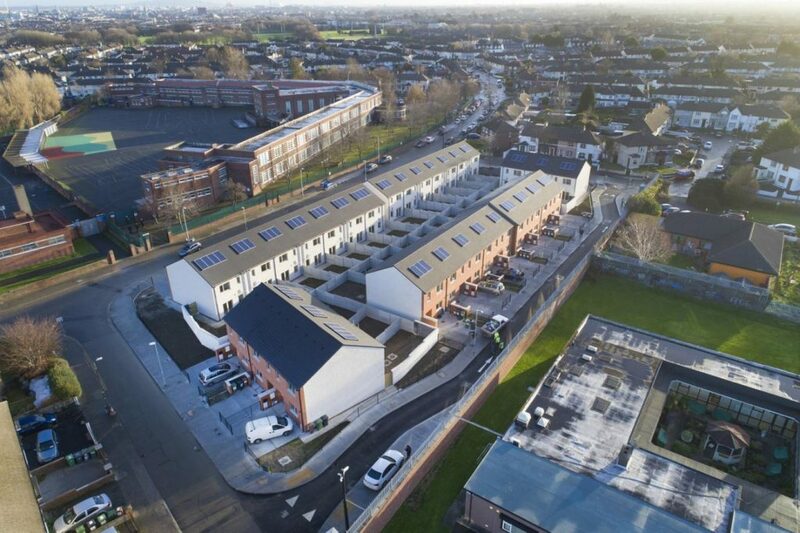 ABM Design & Build awarded the contract to Clean Energy Ireland to design, supply and fit the Solar PV systems to lot 2 and lot 4 of Dublin City Councils Rapid Build Housing scheme. The houses are the second phase of rapid build housing announced as an emergency response to the housing crisis. The lots consists of a development of 29 Houses in Drimnagh and a second development of 39 Houses in Finglas. Each House will be supplied with a PV system consisting of an array of PV panels mounted on the roof, a DC/AC Inverter in the loft space wired directly into the electrical distribution board of the building. Structural engineers have been contracted to undertake the analysis of the structural action of the wind load on the PV array and the mounting components of the PV system. A full analysis was undertaken and the analysis concluded that the mounting system was well within the required parameters of the relevant standards. Each PV system was installed, tested and commissioned to the highest level and compliance all relevant standards. The home owner was instructed on the use, maintenance and all other aspects of the system. The home owner is than provided with all the relevant documentation. The entire project was completed within time and budget. Since the installation has been completed the homeowner have reported that the energy prices are very low and the houses are very comfortable. The contractors were also extremely satisfied and have awarded further contracts to Clean Energy Ireland to install PV on other developments.